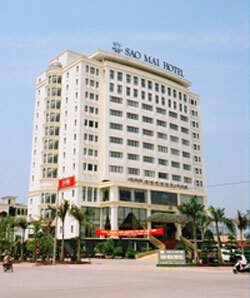 Sao Mai Hotel is a 3 star hotel international standards, went into operation in June 2004. With over 100 rooms with luxurious furnishings, fully equipped, warmly decorated, elegant. Come to Sao Mai hotel you will really feel comfortable, convenient and pleased by the professionalism and friendliness of the entire staff. With the quiet, good service and a convenient location, station cleaned with a 5-minute walk, right next to the hotel is the commercial center of Dien Bien, the financial center of Thanh Hoa with the banking system state and non-state enterprises. Come to Sao Mai hotel guests will enjoy a space like in his beloved home. To the system of Sao Mai hotel restaurant, you not only feel the quiet, the friendliness of the hotel staff that our customers will enjoy the delicious, nutritious taste clients from different domain. Polite restaurant, Morningstar restaurant with 500 seats for conferences, parties, weddings. Our restaurant with highly professional service style is sure to make you satisfied, we specialize in serving Vietnamese cuisine and famous, the talented hands of the chef will give you the traditional flavor meals and appetite every meal. Multi-functional meeting rooms, furniture can be arranged upon request from 20 to 500 seats equipped with audio equipment, lighting, and equipment for presentations ... technicians. Inspiring large meetings, regional conferences in a luxurious, quiet, attentive service, flexible layout, space, luxury and a convenient location. While in Sao Mai hotel you can rest assured playful delight our pool. Water used for swimming pools of the hotel is purified and sterilized by high-tech and modern to ensure the safety of users. Besides Sao Mai also has a tennis court, sauna area with a full range of modern facilities such as: cold hot jacuzzi hot tub, sauna, steam bath, this really is a luxurious, peaceful and professional to inspire and relax the spirit. The sauna will give you absolute pleasure.